Parked in front of a computer, channeling thoughts through a keyboard, **I’m rarely aware of what the rest of my body is up to. I only hear from it when it complains:** sore back, restlessness, stiff shoulders. You know the deal. There’s fodder enough in the debate about the dangerous sedentary lifestyle **(“[sitting disease!](http://markets.on.nytimes.com/research/stocks/news/press_release.asp?docTag=201206260930PR_NEWS_USPRX____CL30512&feedID=600&press_symbol=24770020))”. ** To counter the evils of office chairs, **I’ve attempted to take up a few new habits** and thought I’d share the experience. Just getting into the practice of standing and working, **especially when taking phone calls,** has already cut back hours of sitting. 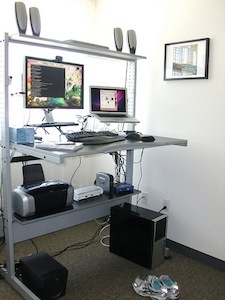 And even now that I no longer have access to the motorized version, there’s still many ways to build an impromptu standing desk, like stacking up boxes on a table or finding a high counter top. **Literally thinking on your feet makes a huge difference to how you feel throughout the day. ** I can really recommend trying it, even if just for a few minutes. The desk-bound can also find relief in stretching. I’ve practiced yoga a few times on and off over the last few years, but it wasn’t until I discovered **the endearing [Ester Ekhart](https://www.youtube.com/user/yogatic)** that it really took off. Her [Youtube channel](https://www.youtube.com/user/yogatic) hits the **right balance of instruction, positive reinforcement, scientific explanation and challenging moves. ** She’s a kind and sincere teacher who you just enjoy listening to. What makes it all the more compelling is that you can queue up a number of sequences and watch them in your own time, in your own space, which means it’s easier to get around to doing them instead of going to a class. Yoga reestablishes an awareness of the body, especially posture, at which I’ve always been miserable. You learn so much about observing tightness and misalignment, and then *gently righting yourself and making it easier to breathe and relax,* even when you’re locked up at your computer. It’s only until very recently that, inspired by a dinner conversation with a meditation instructor, I decided to tip a toe into meditation. This always seemed like a somewhat unappealing activity. Mostly because of prejudice I have about New Age-y stigmas, it didn’t seem right to try meditation. It makes so much sense. **Geeks are very good at getting out of their bodies,** of thinking abstractly and in different times & spaces. **But you need techniques to stitch it all back together,** the mind and the body. And a lot of internet practices encourage a frenzied, output-driven mode of operation. And so you have to learn how to calm the mind and focus it, rather than let it get all scattered in the ether. I’m thoroughly enjoying mindfulness, thanks to yoga on Youtube and meditation via a web app.